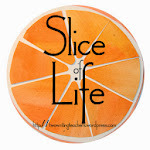 What an exciting day this has been -- no school so plenty of time for organizing taxes, reading the next book for my adult book club, finalizing plans for #Dublit15, and choosing the finalists for my #NF10for10 list. I promised myself I wouldn't do it, but I've already picked at a few of the lists - so many books I need to read and, most likely, purchase (and after just looking at the total amount I spent on books in 2014, I hope my husband doesn't read this post)! I love the different thematic ways people approached choosing their books. 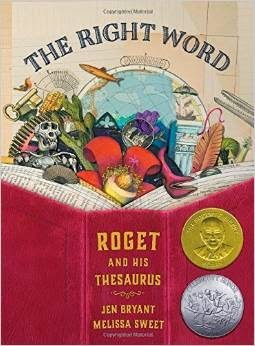 1) The Right Word: Roget and His Thesaurus written by Jen Bryant and illustrated by Melissa Sweet caught my fancy the moment I saw it. A book about words that includes wonderful vocabulary and their definitions, and a boy who loves words; what is not to love about that?! A perfect book to share for a word study lesson. But the power of this book for me has been in sharing with students and teachers how a passion for something can begin early in life and you can carry that passion into adulthood. 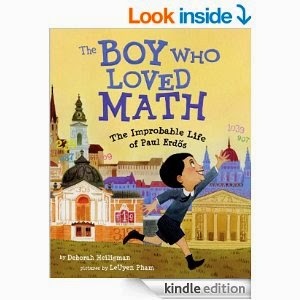 2) Which leads me to another biography that I have shared many times this past year: The Boy Who Loved Math: The Improbable Life of Paul Erdos written by Deborah Heiligman and illustrated by LeUyen Pham. Paul Erdos loved numbers from an early age, so much so, that basic life skills tended to escape him. I used this book frequently to share how to read across multiple texts (pairing it with The Right Word), and then to contrast/compare information about individuals, their motivations, and the conflicts they met along the way. 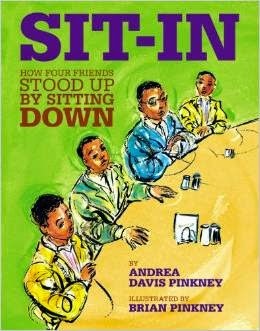 3) Sit-In: How Four Friends Stood Up by Sitting Down by Andrea Davis Pinkney and illustrated by Brian Pinkney is another go-to text for me. I recently paired it with some excerpts from Jacqueline Woodson's brilliant book, Brown Girl Dreaming, to help give context to some of the southern racial backdrops of 1963 in that book. This is also a nonfiction book that can help teach theme - students are amazed at the perseverance these college students demonstrated through the adversity others brought to them. 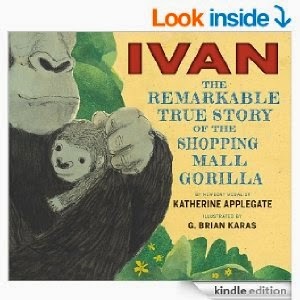 4) Ivan: The Remarkable True Story of the Shopping Mall Gorilla by Katherine Applegate is a wonderful text to pair with her story, The One and Only Ivan. The compare/contrast that could happen between the fictionalized account of Ivan and the true story is a good conversation to have with students. In addition, it is a great mentor text for informational writing, specifically biographies. 5) El Deafo by Cece Bell - I'm not sure what I can say about this book that others haven't already said. But the power of this book is great - it allows ALL children to see that they may have a story to tell, and more importantly, it allows them to see the power of embracing their individuality. I know the Newbery committee did not judge it as a picture book, but I feel comfortable putting it on this particular list. It has allowed me to demonstrate for both teachers and students the power of the graphic novel format; words are critical to telling a story in a more powerful way. 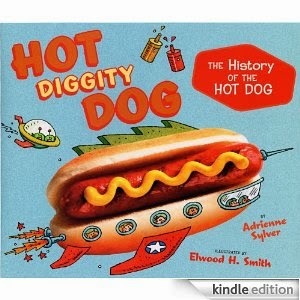 6) Hot Diggity Dog: The History of the Hot Dog by Adrienne Sylver had been a popular mentor text in my 5th grade classrooms the past few years, and then this year, I used it many times as a mentor text for informational writing. I love that each 2 page spread can be read and analyzed individually - I did much work with 3rd graders thinking about cause/effect as a text structure on these pages. And what a great topic to gather interest! 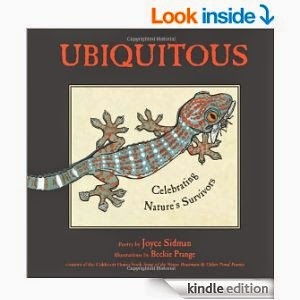 7) Ubiquitous by Joyce Sidman. I feel like that phrase can almost stand alone. Sidman is at her best when combining genres (using informational text and poetry) within her nonfiction picture books - The Dark Emperor is another wonderful example of this. Using Ubiquitous, I modeled for teachers how they could use a text like this to help push writers who might need a challenge. Recently, when I worked in 3rd grade classrooms, some students were very clear on how to gather information and organize it into paragraphs or other like groupings. I shared Ubiquitous as a text that could be a choice for them - try to organize their thinking about their chosen topic into a different genre. It was fun to watch them stretch their writing skills. 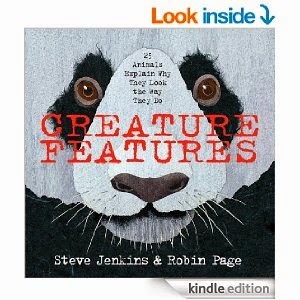 8) Creature Features: 25 Animals Explain Why They Look the Way They Do by Steve Jenkins and Robin Page. The first reason I bring this to classroom is because Steven Jenkins is a go-to nonfiction writer that students need to know. I love how the point of view in this book is each of the animals and they are sharing information about themselves by answering a letter. This is another great mentor text to share with students writing informational pieces - that letter format is a great one to borrow and it makes organizing more manageable for some. 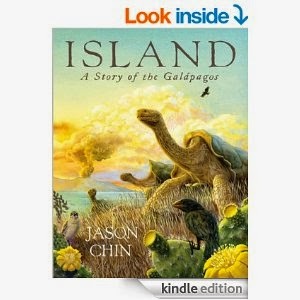 9) Island: A Story of the Galapagos by Jason Chin is a wonderful addition to any classroom. I share this a lot in 5th grade classrooms, as a perfect example of how to blend science learning (our state has learning about adaptations to environment as a 5th grade skill) and literacy. Cause/effect and problem/solution - this book has it all. In addition, this has been a great introduction into timelines as an infographic. The book is divided into sections, each millions of years apart. Creating a timeline for the Galapagos Island from the information has been good practice. 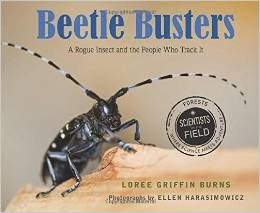 by Loree Griffin Burns is part of the Scientist in the Field series of informational texts. I love the series, but what I love when I share this in classrooms is how it is so well written, I actually care about what is going on with beetles (and I don't even like bugs one little bit). The organization into chapters, how it reads in such an interesting way (not dull at all! ), additional sections added in between chapters. This is a book I've tended to share more with 4th and 5th grade teachers as I've talked about the standards, specifically RI.4.10 and RI.5.10 - the standard at 4th and 5th grade that deal with text complexity. While I am a firm believer in what Dorothy Barnhouse shared at NCTE - we shouldn't try to begin teaching complex standards with complex texts; we should begin with simpler texts and make sure the learning is solidly in place - I do think it is important to scaffold readers into more complex texts and a book like Beetle Busters could fit the ticket. Well that's it for this year. 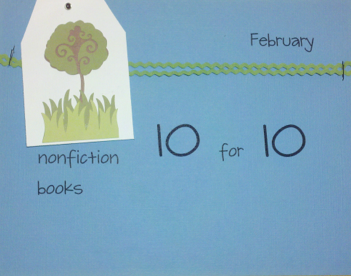 There are so many great books that I'm sure would work equally as well, so I'm excited now to head over to the Google community to see what others have put in their #NF10for10 lists! Thanks to Mandy and Cathy for hosting!! I love each one, except don't know Hot Diggity Dog, Karen, so will add that to this long, long list! I too love The Right Word, have shared with my middle school students & they've enjoyed it too. Any of Steve Jenkins' books are a delight-nearly everyone has one of his to share-amazing. And the Joyce Sidman is another good one to use. She does such wonderful things with poetry & research! Thanks! Great selection Karen. Sit In is on my wish list, andI'm so glad to see the Galapagos book - fascinating story. You have many books on your list that I would like to add to mine-Hot Diggity Dog for one...I am starting my list. Like you, Karen, I am most likely purchasing books after this...but it's money well spent right? I hope I can get a chance to meet up with you at Dublit! I am going to it this year! I've been busy clicking away at the library website to request some of your titles. Thank you for taking the time to tell us how you like to use them as well. I'm glad you were given the gift of time to share them with us. Thanks for joining us, Karen. I need to look into the Scientist in the Field series and I can't believe I don't have the book, The Boy Who Loved Math! I love the variety in your list! So fun to read other people's lists and think, "Hey, I have that book, but I haven't used it for a while, where is it?" which is what I did with SIT IN and HOT DIGGETY DOG. I haven't read EL DEAFO yet. I'm on the reserve list at the library, but it's taking forever to get to the top of the list! I may have to buy it. This is a great list. There are a few titles that are new to me, and I am off to AMAZON.COM to buy them. Thanks for taking the time to post! Karen, Have you read NO MONKEYS, NO CHOCOLATE by Melissa Stewart and Allen Young? Fascinating and fun! Thank you for all of these titles. Hot Diggity Dog and Beetle Busters are new for us. We can't wait to read them.